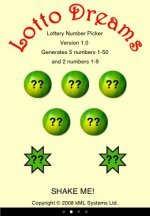 Everybody dreams about what they will do if they win the lottery but many people find it difficult to choose the numbers to use. 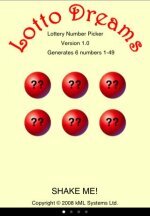 Lotto Dreams will help you pick numbers to use for your Lottery entry. 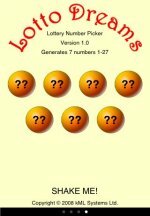 In this application, a number of pages have been provided where each page represents a different combination/selection of numbers. 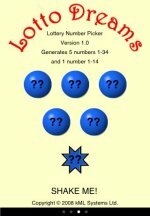 Simply choose the relevant page and shake your iPhone, or iPod Touch, to generate a set of numbers to use. You never know, you might even win, but nothing can be guaranteed. How do you change the page? Simply swipe across the current page, or click on the dots at the bottom of the screen, to select the next or previous page.